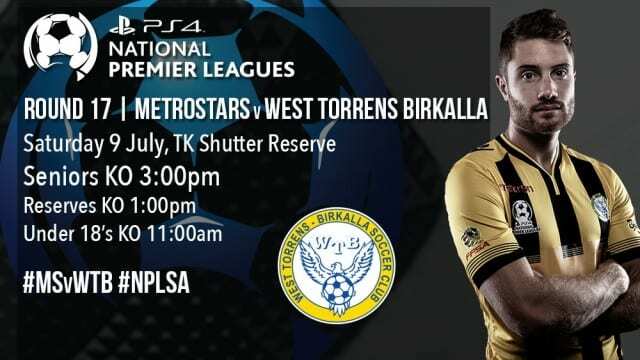 MetroStars briefly rose up the ladder after another impressive display with a 2-0 win over third placed West Torrens Birkalla in Round 17 of the PlayStation 4 National Premier League South Australia. A second half double from striker Jonathon Negus saw the Klemzig club jump up to fifth, only one point behind Adelaide Blue Eagles in fourth place but with other results going against them, Metro remained in sixth place at the conclusion of Round 17. Anthony Sologna was happy that his side was able to build on its recent form and continued to get results against quality opposition. “I thought the game was really tough,” he said. “(Birkalla) are a good side and we had to work hard to stop them for playing, I thought we played well and built on our recent good form. It was a tough day at the office for Birkalla who saw their grip on third place loosen as a win for Adelaide Comets put them only two points off the pace. Birkalla full back John-Paul Cirillo said the Novar Gardens club never really got going against a side in great form. “Metro at home are always a tough task and we have always found it hard going there, we found it hard to break them down and really created few chances compared to previous weeks. “Of course dropping points has allowed Comets to catch up and somewhat has now put pressure on us but we need to put last week’s game behind us and concentrate on Croydon. Metro signalled their intent early on as they pressed the Birkalla back four, forcing them to rush their passes and turnover possession. Negus spurned a chance to open the scoring after latching onto a misplaced pass but directed his shot wide. Minutes later, Metro had shouts for a penalty waved away as the ball looked to have struck the hand of Tom Ditmar inside the box. Birkalla began to put their stamp on the contest as their creative players began to get on the ball but struggled to break down the Metro back four. Ian Kamau pulled the strings in the middle and looked a threat in the final third with his trickery; Lawrence D’Arrigo was played in by Kamau with a clever ball but it was a little too heavy for the winger as Callum Piantadosi collected before he could get his foot on it. Bailey Truscott had the best chance of the first half as he was played in down the right hand side with a ball from the back but was quickly closed down, however the youngster still managed to fire off a shot but it rolled just wide of the far post. Down the other end of the pitch, Kamau played in Fumiya Suzuki on the left who promptly laid it off to Kawamura as he made his run into the box. The striker took it first time but flashed his powerful shot just past the far post to keep the scores level at the end of the first half. The deadlock was broken quickly after the restart as Metro came out firing, a couple of rapid shots forcing the best out of Torresan but Negus capitalized in typical goal poacher fashion by poking home the rebound. Taro Kawaruma had a couple of good chances to tie things back up but was thwarted by Piantadosi between the sticks. Birkalla’s chances rapidly dimished in the 71st minute as Le Cornu was shown a straight red for bringing down Truscott on the edge of the box. As expected, the extra man played into Metro’s favour as they pressed for a second. It eventually came two minutes from time as substitute Christian Esposito, making his debut for the club, broke through Birkalla’s lines and forced a save out of Julian Torresan. Espoito grabbed the rebound with his back to goal and found Negus arriving in the box who poked home his cross to seal the three points.